Industries involved in the manufacturing of 3D forms such as Aerospace, Prototyping, Mold Tools and General Engineering will all benefit from EDGECAM’s 3D machining cycles. EDGECAM offers not only best in class prismatic machining capabilities, you also have powerful 3D solid and surface machining strategies, all in one solution. With an extensive suite of advanced 3D cycles that are ideally suited for rapidly generating toolpaths for all surface and solids machining needs, EDGECAMs advanced machining cycles bring optimised toolpath control, reduced cycle times and an overall higher level of machining efficiency. Unlike many CAM systems, EDGECAM is ‘CAD neutral’, so whatever CAD system you use, interoperability between CAD and CAM is seamless, with no data translation. This means that you machine exactly what the designer intended and toolpaths remain associative to the master model. Autodesk Inventor®, Solid Edge®, SolidWorks®, Pro/ENGINEER®, Pro/DESKTOP® Unigraphics files up to and including NX5, and CATIA V5. EDGECAM also accepts files in the following independent formats: IGES, DXF, VDA, Parasolid ® , STEP AP203 and AP214 files and ACIS. 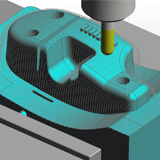 Extensive range of 3D cycles 3D machining technology is embedded in all EDGECAM’s milling cycles and applies 2D or 3D toolpaths based upon the cycle being used and the interrogation of the geometry to be machined. Roughing EDGECAM applies the most efficient approach move for each region of the model utilizing waveform cycle and trochoidal cutter paths to avoid full width cuts, automatically adjusting the toolpath for efficient and safe machining, improving cutting conditions and allowing higher machining speeds to be maintained. Waveform Roughing Waveform cycle is superior to the traditional roughing cycle where machinable geometry is offset inward or outward by % step over. TRADITIONAL tool paths have to run slower feeds and speeds due to the variable widths of cut condition when encountering corners and material entry. Wave form toolpath has been developed to remove tool load spikes and maintain and even chip thickness and generating a fluid tool path throughout the machinable elements using a flowing motion. Consistent tool loads generated from the waveform tool path offers the user the opportunity to rethink speeds, feeds and depths of cut. 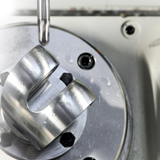 The Waveform tool path increases tool life and is also kinder to the machine tool. Rest Machining This intelligent cycle can automatically remove areas of residual material left behind by the tool size and depths of cut. Intermediate slices may be used to reduce the size of the step left by the roughing cycle. Only the step region is machined for intermediate slices. Rest roughing allows the use of large tools to clear away the bulk of the material for the main roughing then select a smaller tool to remove residual material, thus optimizing cycle times. Parallel Lace This command is sometimes referred to as scanning. A series of parallel toolpaths are applied to the model to produce a finish part or used with depths of cut to produce a roughing cycle. Profiling Profiling commands are essential not only for 2.5D machining, but also for 3D freeform machining. You use this cycle to finish surfaces in a series of XY profiles down the Z axis on surfaces and solids. 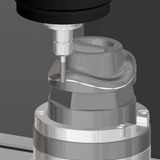 Using cusp height control, this will adjust the depths of cut to maintain a constant surface finish. Steep and shallow areas can also be controlled allow the shallow areas to be finished using alternate techniques. 3D profiling can be applied to follow profiles in XY and Z moves, reducing air cut time by following the components 3D form. Lead in and lead out moves are calculated to avoid any gouging of the component or stock. Projection When machining 3D forms, specific tool path patterns may be required such as circular, radial or spiral on a boss, possibly following flow curves. Controlling these paths is made easy by creating 2D tool paths then projecting the patterns onto the part surface. This technique is very useful for engraving logo’s and text. Finishing Along with projection methods, Constant Cusp machining can be employed to produce an even surface finish on large areas of a mold tool or component. 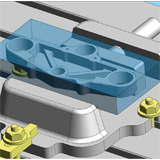 The toolpath constantly adjusts to follow to part surface shape resulting in a uniform cusp. The use of Rest Finishing and Pencil Milling cycles allow the user to machine the internal corners and radii of the model, ensuring the finished component is fully machined with little or no hand dressing. Many complex parts are not all freeform shapes where full XYZ movements of the machine tool are required, but have many flat areas where a standard end mills would be produce a faster toolpath and superior finish. EDGECAM’s Flat Land command will automatically seek out and machine these Flat regions. When combined our 3D Machining cycles with our 5 axis module, the capability of converting 3 axis tool paths to 5 axis toolpaths provides the ability to get better reach and cutting conditions.